Appearing to jibe with a report in the Los Angeles Times Tuesday evening which asserted that Special Prosecutor Patrick Fitzgerald is turning his sights back to Bush's chief advisor, Karl Rove, Roll Call's Mary Ann Akers will report in Wednesday's editions that Fitzgerald was seen at Rove's lawyer's offices. Rove is among numerous officials who have been questioned about whether they had a role in outing covert CIA agent Valerie Plame Wilson, the wife of ardent Iraq intelligence critic Joseph Wilson. According to Roll Call, Fitzgerald was spotted Tuesday at the law offices of Patton Boggs, the firm that employs Rove's lawyer Robert Luskin. Though Akers says in her column she "heard about the visit from a well-placed source," Luskin refused to confirm "why or even whether Fitzgerald visited him." Akers adds: "The rumor floating around Patton Boggs Tuesday was that there “may” be no indictments this week because Fitzgerald “may” need to seek an extension from the presiding judge to wrap up his investigation of Flamegate (or Plamegate for those of us who aren’t Judy Miller)." Sources close to the investigation told RAW STORY Tuesday that indictments had already made their way to the grand jury in the case, and that others were in preparation. Fitzgerald's agents also visited the Wilson's neighbors Monday, asking them whether they were aware that Valerie was a covert CIA agent, according to the L.A. Times and the Associated Press. 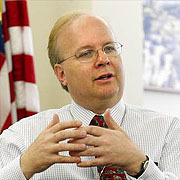 Rove, Akers asserts, "was spotted visiting his lawyer on Friday." The full paid-restricted column is available at Roll Call. Originally published on Tuesday October 25, 2005.